Travelling over Christmas took me to Bargara. This small town hugs a coastline scattered with basalt rocks, remnants of a long extinct volcano, and nestles into the broader reach of the regional city of Bundaberg, which sits twelve kilometres inland. Two years ago, Bundaberg was a focal point of news services across the world because of the destruction and dislocation caused by floods. The city and its coastline is newsworthy for another reason. It is where the Great Barrier Reef begins. People typically associate Cairns, Port Douglas or the Whitsunday Islands with the Great Barrier Reef. Yet these areas represent only about ten percent of the Great Barrier Reef Marine Park. The Great Barrier Reef stretches for 2300 kilometres along Australia’s east coast. In his compelling account of twelve extraordinary tales about this iconic natural wonder, Iain McCalman (1) estimates the Great Barrier Reef is about the size of England and Ireland together. It extends to the very tip of Cape York in the north and in the south, well that’s why I’m writing. Its southern gateway lies off the coast from Bargara. So when I rode my bike along the Coral Coast Pathway on Christmas Eve, the view from my handlebars was the Coral Sea where the Great Barrier Reef begins. The Coral Coast Pathway is a shared way for pedestrians and cyclists. I set off from Kelly’s Beach at Bargara and road to Burnett Heads at the tip of the Burnett River. The return trip is twenty-one kilometres. It’s a beautiful ride. The best thing about riding in Bundaberg is that it’s flat. There’s only one hill to elevate the landscape and that’s the remains of the extinct volcano known as the The Hummock. The rest is flat with only a few gentle climbs. The Coral Coast Pathway meanders along the esplanade parks that edge the foreshore at Bargara and then turns inland for a moment, passing through a stretch of melaleuca trees. It opens up to a grassed paddock where twelve months earlier in 2013, I saw a mob of kangaroos grazing in the late afternoon. This time I rode mid-morning and with the hot weather, I suspect the mob were probably lazing under a shady tree somewhere until the sun softened later in the day. There is a little bridge to traverse the salt marsh wetland which, on the way out, was a collection of random puddles and, with the incoming tide, later turned into a fully-fledged waterway. Along the path there is also a turtle rookery known as Mon Repos. What’s a place in a regional Queensland doing with a French name? In the late 1800s a telegraph cable from French Caledonia was laid across the Coral Sea and this area is where the cable touched the Queensland coastline. The testing house for the cable adjoined a homestead owned by a pioneer of the local sugar industry, Mr A.P. Barton. He named his homestead Mon Repos – “My Rest”. As for the turtles that touch the coast at Mon Repos, there is no rest for them. They arrive on the grainy sands every year to lay their eggs each night between November and February to audiences from all around the world. The Coral Coast Pathway meanders around the Mon Repos Conservation Park – past waterholes where choruses of cicadas fill your ears and stop you from talking; it winds through the coastal casuarina trees and behind the sand dunes where the turtles make their nests. 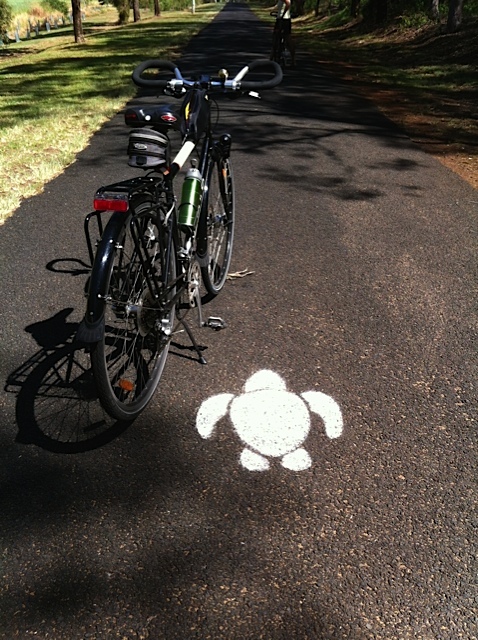 You just have to follow the turtle markers. The Coral Coast Pathway is a really enjoyable bike ride. It has a variety of landscape, beautiful birds and the presence of the turtle rookery reminds me of the magnificent reef that starts just beyond these shores. I don’t want to imagine a world without the magnificent beauty of the Great Barrier Reef. 1. If you are interested in knowing more about the Great Barrier Reef, I recommend Iain McCalman’s book: McCalman, I. (2013). The Reef: A Passionate History. Penguin: Melbourne, Australia. 2. Unfortunately, this magnificent natural wonder that we know as the Great Barrier Reef is threatened by the ever-increasing development of mega-ports for coal mining. The world’s largest coal port has been approved for a site only fifty kilometres from the Whitsunday Islands. For more information follow this link to The Australian Marine Conservation Society. If you enjoyed this story, click ‘Yes email me new stories‘ and receive my stories straight into your email inbox 🙂 If you know other people who might enjoy it, use the icons below to share it with them on Twitter, Facebook, Pinterest, Google+, LinkedIn or via email. You can also read the About page to find out how this bike riding experiment began and why I’m doing it. Well it seems I have read this post ‘hot off the press’ and have thoroughly enjoyed a vicarious ride along the Coral Coast Pathway. The embedded videos remind us of how precious and vulnerable our Barrier Reef is. Thanks for an enjoyable and informative read Gail. You sure have read it ‘hot off the press’ Robyn 🙂 The reef is such an amazing natural beauty and it is good to see its protection being raised as an issue in this weekend’s Queensland election. Ah the tranquility! Having fun and at the same time sharing your experience and knowledge. Great reads Gail – keep it up! I really liked your blog. Please talk to the Bundaberg Tourism authority to collect a free meal, because you have reminded us of a destination that is close enough to Brisbane and has a variety of options for play – bikes and kayaks for us. It’s on our list, thank you. I have also ordered Iain McCalman’s book. My Mum, shy introvert that she was, actually went door knocking in the early 70’s to get signatures on the petition to stop the proposal to drill for oil on the reef. It’s been under threat from humans for a long time. That’s great Jenny. The area sounds ideal for you. Also, there is a flight from Bundaberg airport that takes you to Lady Elliot Island which has very good snorkelling. I’m keen to take a visit there. I really enjoyed the stories in Iain McCalman’s book. It’s very well researched and his writing brings the history of the reef alive very well through each tale. And I love your little aside about your Mum protesting for the reef’s protection. What an inspiration!